After reviewing references listed for the Pebble Draft Environmental Impact Statement (DEIS) and the 2014 EPA Bristol Bay Watershed Assessment (BBWA), we found 42 documents in common. We also looked at the prevalence of terms in the DEIS reference list compared to the BBWA reference list to get a sense of the topics covered. See those here. Read our overall analysis. ADEC (Alaska Department of Environmental Conservation). 2003. Alaska Water Quality Criteria Manual for Toxic and Other Deleterious Organic and Inorganic Substances. May. ADEC (Alaska Department of Environmental Conservation). 2011. Water Quality Standards: Alaska Department of Environmental Conservation. Report 18–AAC–70. ADEC (Alaska Department of Environmental Conservation). 2011a. Alaska Pollutant Discharge Elimination System General Permit for Discharges from Large and Small Construction Activities. Permit Number AKR100000. Anchorage, AK. ADEC (Alaska Department of Environmental Conservation). 2012. Water Quality Standards Amended as of April 8, 2012. Juneau, AK: Alaska Department of Environmental Conservation. ADNR (Alaska Department of Natural Resources). 2005. Bristol Bay Area Plan (BBAP) for State Lands. ADNR (Alaska Department of Natural Resources). 2005. Guidelines for Cooperation with the Alaska Dam Safety Program. Dam Safety and Construction Unit, Water Resources Section, Division of Mining, Land, and Waters. ADOT (Alaska Department of Transportation and Public Facilities). 2004. Southwest Alaska Transportation Plan. Anchorage, AK. Auerbach, N. A., M. D. Walker, and D. A. Walker. 1997. Effects of roadside disturbance on substrate and vegetation properties in Arctic tundra. Ecological Applications 7:218–235. Braund, S. R., and Associates. 2011. Chapter 23: Subsistence Uses and Traditional Knowledge, Bristol Bay Drainages. In Pebble Limited Partnership. 2011. 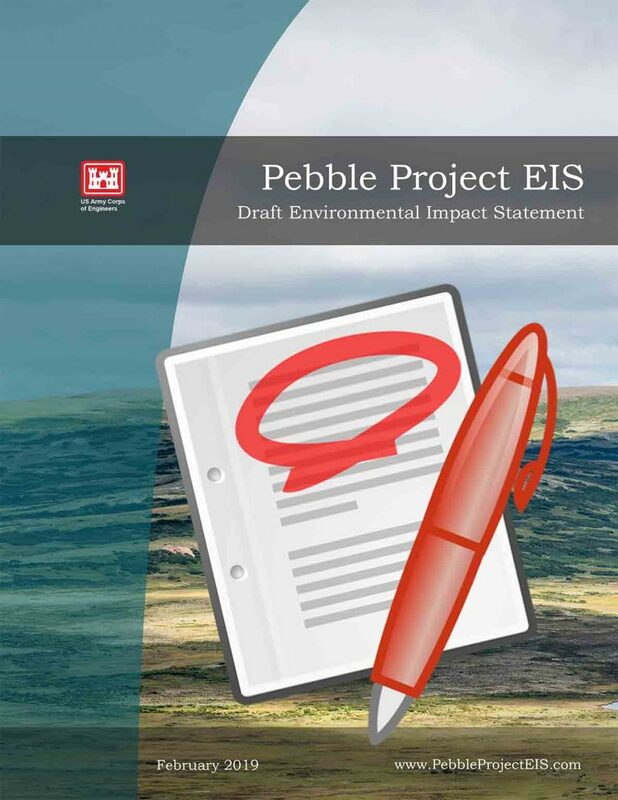 Pebble Project Environmental Baseline Document 2004 through 2008. Available: http://www.arlis.org/docs/vol2/Pebble/2004- 2008EBDIndex.pdf. Brna, P. J., and L. A. Verbrugge (eds.). 2013. Wildlife Resources of the Nushagak and Kvichak River Watersheds, Alaska. Final Report. Anchorage, AK: Anchorage Fish and Wildlife Field Office, U.S. Fish and Wildlife Service. Chambers, D. M., and B. Higman. 2011. Long-Term Risks of Tailings Dam Failure. Bozeman, MT: Center for Science in Public Participation. Available: http://www.csp2.org/files/reports/Long%20Term%20Risks%20of%20Tailings%20Dam%20Failu re%20-%20Chambers%20%26%20Higman%20Oct11-2.pdf. Davies, M. P. 2002. Tailings impoundment failures: are geotechnical engineers listening? Geotechnical News. September: 31–36. Detterman, R. L., and B. L. Reed. 1973. Surficial Deposits of the Iliamna Quadrangle, Alaska. Geological Survey Bulletin 1368-A. U.S. Geological Survey. Fall, J. A., D. L. Holen, B. Davis, T. Krieg, and D. Koster. 2006. Subsistence Harvests and Uses of Wild Resources in Iliamna, Newhalen, Nondalton, Pedro Bay, and Port Alsworth, Alaska 2004. Technical Paper No. 302. Juneau, AK: Alaska Department of Fish and Game, Division of Subsistence. Fall, J. A., T. M. Krieg, and D. Holen. 2009. Overview of the Subsistence Fishery of the Bristol Bay Management Area. Special Publication No. BOF 2009-07. Anchorage, AK: Alaska Department of Fish and Game, Division of Subsistence. Haeussler, P. J., and C. F. Waythomas. 2011. Review of the Origin of the Braid Scarp Near the Pebble Prospect, Southwestern Alaska. U.S. Geological Survey Open File Report 2011-1028. Haeussler, P. J., and R. W. Saltus. 2004. 26 km Offset on the Lake Clark Fault Since Late Eocene Time. Studies by the U.S. Geological Survey in Alaska, 2004. U.S. Geological Survey Professional Paper 1709-A. Hall, J. V., W. E. Frayer, and B. O. Wilen. 1994. Status of Alaska Wetlands. U.S. Fish and Wildlife Service, Alaska Region, Anchorage, AK. Available: http://www.fws.gov/wetlands/Documents/Status-of- Alaska-Wetlands.pdf. Hamilton, T. D. 2007. Surficial Geologic Map of the Pebble Project. Report C-1. Anchorage, AK: The Pebble Limited Partnership. Holen, D., J. Stariwat, T. M. Krieg, and T. Lemons. 2012. Subsistence Harvest and Uses of Wild Resources in Aleknagik, Clark’s Point, and Manokotak, Alaska, 2008. Technical Paper No. 368. Anchorage, AK: Alaska Department of Fish and Game, Division of Subsistence. Holen, D., T. M. Krieg, and T. Lemons. 2011. Subsistence Harvests and Uses of Wild Resources in King Salmon, Naknek, and South Naknek, Alaska, 2007. Technical Paper No. 360. Anchorage, AK: Alaska Department of Fish and Game, Division of Subsistence. ICOLD (International Commission on Large Dams). 2001. Tailings Dams, Risk of Dangerous Occurrences, Lessons Learnt from Practical Experiences. United Nations Environmental Programme, Bulletin 121. Johnson, J., and P. Blanche. 2012. Catalog of Waters Important for Spawning, Rearing, or Migration of Anadromous Fishes – Southwestern Region, Effective June 1, 2012. Special Publication No. 12-08. Anchorage, AK: Alaska Department of Fish and Game. Koehler, R. D., and R. D. Reger. 2011. Reconnaissance Evaluation of the Lake Clark Fault, Tyonek Area, Alaska. Preliminary Interpretative Report 2011-1. Alaska Division of Geological & Geophysical Surveys. Markon, C. J., S. F. Trainor, and F. S. Chapin III (eds.) 2012. The United States National Climate Assessment—Alaska Technical Regional Report. Circular 1379. Reston, VA: U.S. Geological Survey.